Ruben Parnell Brown was born February 13, 1972 in Englewood. Ruben and his family moved to Lynchburg, Virginia when he was a boy and his size and speed enabled him to excel on the gridiron and wrestling mat. He enrolled at E.C. Glass High School in 1987 and became the star of both varsity teams. His younger brother, Cornell, later starred for the Hilltoppers at linebacker. Ruben was a defensive star, too, creating major mayhem from his defensive tackle position. Ruben accepted a football scholarship from the University of Pittsburgh; Cornell went to Virginia Tech. Both earned All-America recognition and went on to play in the NFL. Ruben was honored as a high-school All-American as a senior in 1989. Ruben red-shirted 1990 and became a starter for Pitt in 1991 after coach Paul Hackett moved him across the line to guard. The move was prompted by the fact that he was stuck behind Sean Gilbert and Keith Hamilton on the defensive line. Ruben enjoyed four standout seasons on Pitt’s offensive line. The Panthers has just joined the Big East after decades as an independent. Under Paul Hackett and then Johnny Majors, Ruben anchored the line of a so-so offense. He was a First Team All-American in 1994. He was All-Big East each year from 1992 to 1994. At 6’3” and 300 pounds, Ruben projected as a Pro Bowl quality guard. The Buffalo Bills selected him #14, making him the first guard taken in the draft. He won a starting job in camp as a rookie and beginning in 1996, Ruben fulfilled his potential, earning a Pro Bowl nod eight years in a row. Buffalo’s line was nothing to brag about over the years, but no one did much business at left guard, where Ruben opened holes for the likes of Thurman Thomas and Travis Henry. In 2000 and 2002, he was second-team All-NFL. 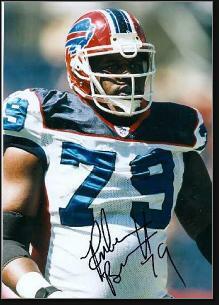 Ruben’s career with the Bills came to an end in 2004. He signed with Bears that season and had one more Pro Bowl season (in 2006, when the Bears made it to the Super Bowl) before retiring after the 2007 season. Injuries nagged him for much of his time in Chicago, but if he was healthy enough to play the Bears started him. In fact, Ruben was a starter in each of his 181 NFL games. After football, Ruben returned to Buffalo, where he got involved with several charities and co-hosted hos own weekly TV show. He was always comfortable in front of a microphone and was one of the best interviews in the NFL when he played.